The circus is in town, and the freaks are ready to put on a show for anybody brave enough to watch. 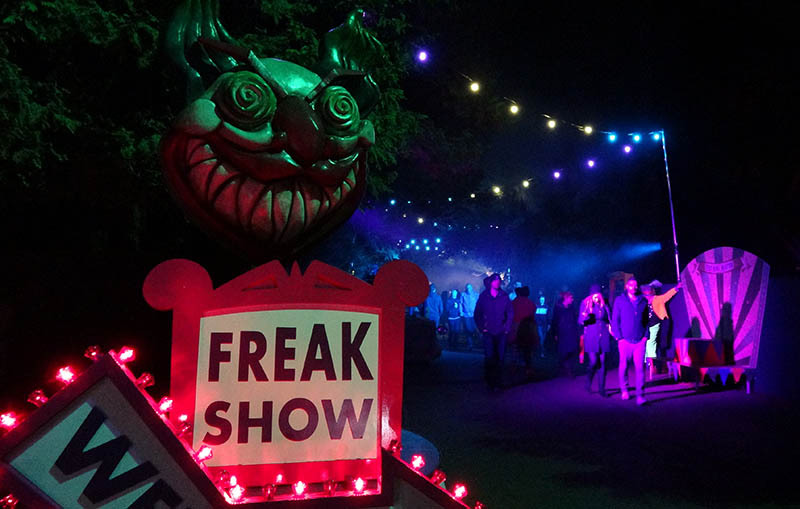 Freak Show was a walkthrough scare zone which opened after dark on the path between Spinball Whizzer and the entrance to X-Sector. It was themed around a carnival freak show, with various circus freaks and other novelty acts ready to interact with guests. While neither lengthy nor particularly scary, Freak Show was a fun distraction for a few minutes. Its position was rather unfortunate as it had to act as a major footpath as well as a dedicated scare zone. This means it never felt completely immersive or tightly packed, but rather empty in places. However, the actors did well and managed to have fun with guests without being over-the-top scary. Just prior to the scare zone opening, the freaks would come out to star in a short show with the Ring Master at the helm. Be warned though, he was looking for volunteers who might well reach a sticky end!